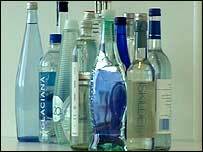 BBC NEWS | Programmes | Panorama | Bottled Water: Who Needs It? "A jug of tap water will be fine thanks..."
On hearing these words uttered at the neighbouring restaurant table, what do you think? Puritan tightwad or sensible free thinker, resistant to the marketing hype? Our investigation might give you something to chew on. Back in the 70s we drank hardly any bottled water. I remember distinctly going to 'the continent' on holiday back then and viewing the inhabitants with a mixture of pity and superiority as they drank from the bottle and mistrusted their tap. We drink 200 times as much bottled water today as we did back then and the market in Britain is worth close to £2 billion. Ironically it was those very European associations that gave bottled water its marketing cachet. Brilliantly exploited by Perrier in their 'Eau' campaign, it brought Mediterranean chic to our tables from Hounslow to Harrogate. And once that high class link was established, British brands took off too - Buxton, Malvern, Strathmore and the rest. Today, to be truly exclusive, water is sourced from even further afield - Hawaii, New Zealand and Fiji. So, now should we stand back and admire the brilliant machinations of capitalism and its ability to create wealth and jobs from nowhere or shout out that the emperor has no clothes? The bottled water business itself makes no claims for the healthiness or safety of their product above what flows from the tap and in our blind taste test tap water performed quite well. But the industry does insist that they're encouraging people to drink more water rather than sugary soft drinks, thus helping the nations health and hydration. But I sense a sea change, driven by an undercurrent of environmentalism which now questions economic activity rather than celebrates it. Producing and delivering a litre of bottled water emits hundreds of times as much greenhouse gas as a litre of tap water. Then you've got the plastic, only one quarter of which is recycled or the glass that eats so much energy to make and re-use. Our environment minister, Phil Woolas, cited all these as motives for returning to the tap (although he did admit to being still partial to a drop of the fizzy stuff). But it was something else which led him to claim that bottled water was "morally unacceptable" - the discomforting fact that while we have perfectly good tap water we spend approaching £2 billion on bottled water when a billion people around the world don't have safe water. In effect, we treat water as a luxury bauble while others die from its absence. 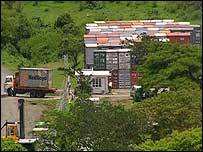 One of the places we import bottled water from Fiji. Called Fiji Water, it travels 10,000 miles to be sold in restaurants and upmarket shops such as Waitrose, Harvey Nichols and Harrods. But on the South Pacific island one-third of the population don't have access to safe clean drinking water. We visited villages where bad water had triggered an outbreak of typhoid - 20 people had been infected and one had died. We saw hospitals reporting a constant flow of patients laid low by dodgy drinking water. The Fiji Water company is not responsible for the islander's supplies. They provide water to some villages near the plant and they are putting some money towards clean water projects across the islands. Indeed Fiji Water would make the case that if you really care about the plight of Fijians you should buy Fiji water as it provides jobs and income for the islands.